This is the most aromatic ingredient that any kitchen should have! Garlic. 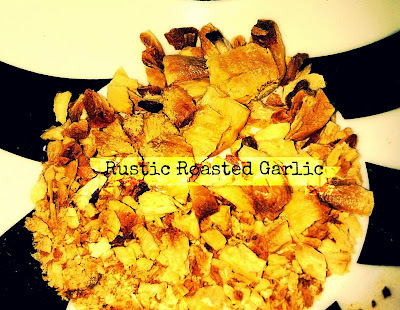 And what better than roasted garlic that is super easy to make,store and use! Spread peeled garlic cloves on a microwave safe baking dish. Microwave for about 20-25 minutes. Then bake these at 180 degree for about 15-20 minutes or till they start turning brown. Take them out and let them cool. Once cooled they will become hard. Store as is or crush into powder. You can add salt to make your own garlic salt seasoning. Its tastes great and a lovely seasoning for snacks, garlic bread, soups & more! Keep watching this space regularly for some exciting and easy recipes. Recipes from Around the World! 24 Boxes Cookbook is now available on Amazon! Good Food Bytes by Nidhi Jain is licensed under a Creative Commons Attribution-NoDerivs 3.0 Unported License. Based on a work at goodfoodbytes.blogspot.com. Permissions beyond the scope of this license may be available at crayoncreatives80@gmail.com.